No one makes dessert pizza like Ci Ci’s. You can enjoy this treat at home. Canned cherry pie filling helps you make this wonderful fruit pizza. You can make a Cherry Dessert Pizza just like Cicis. Prepare pizza dough as directed. Spread pizza the dough on greased pizza pan and prick with a fork 8 - 10 times. Place in preheated oven at 450 degrees for 5 minutes. 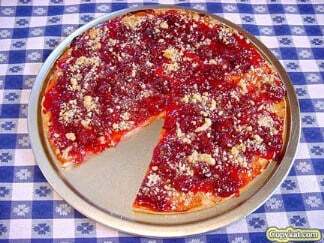 Remove pizza dough from oven and spread with cherry pie filling. Sprinkle with 1/4 cup of crumb topping and place back into the oven and bake for 20 - 25 minutes. Remove pizza when the dough is golden brown. Serve as a dessert or a wonderful after school snack for the gang. Crumb Topping Directions Mix flour, sugar, brown sugar, and salt. Place butter with the mixture and blend until the topping resembles cornmeal. This topping can also be used on baked fruit desserts. Why only use 1/4 of the crumb? Seems like a waste of ingredients if your not using all of it. I thought the same thing. So I used all of it and it worked really well. Was the most popular part of the dish w/my friends. The kids loved this! I will be making this the next time I have a whole bunch of kids over.